Parking Prankster: Is Brian Cook of Armtrac using staged photos? Is Brian Cook of Armtrac using staged photos? Some of the more unscrupulous parking companies have found that by using staged photographs they can issue a parking charge even when no contravention has occurred. Here are the photographs taken by Brian Cook's warden at Lusty Glaze in Cornwall. They are apparently staged to imply that the details on the parking ticket are not visible. 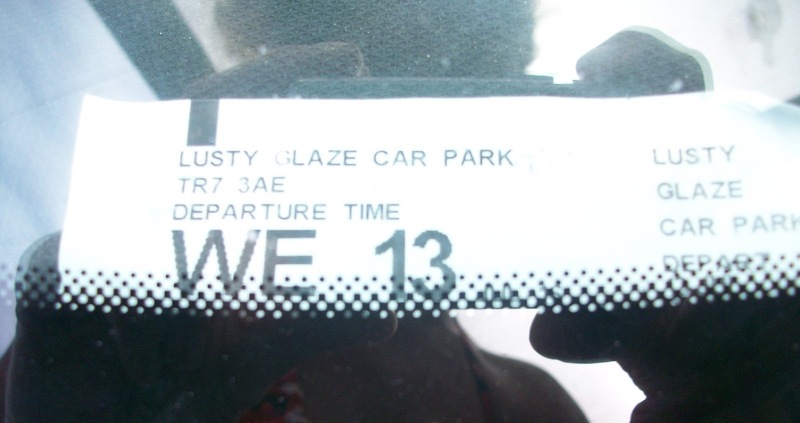 Here is a photo taken by the motorist on return to the vehicle, apparently showing that you can read the expiry time. Here is another photograph taken by the motorist from a different position. As you can see, the angle from which the photo is taken can either make the expiry date visible or non-visible. Here is yet another view. Sadly Armtrac are not the only parking company wise to this game. In Link v M in Bristol this week, the motorist argued that their permit was properly on display and stated the photographs supplies as evidence did not support Link's case. 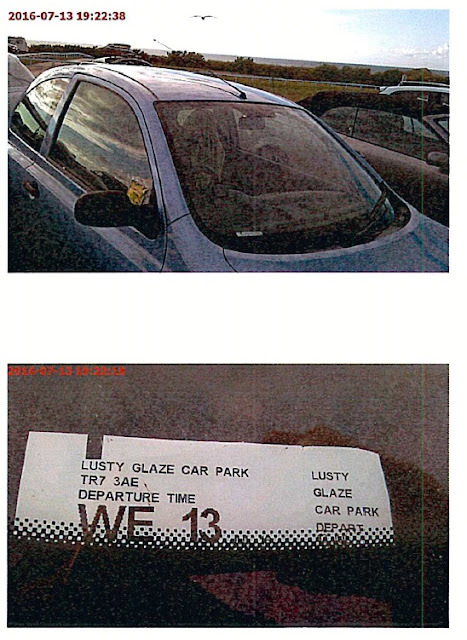 The judge agreed that the photos were of a poor quality and commented that there was glare but went on to say that he was satisfied that the Link employee had gone to a lot of trouble which he would not have done had the parking permit been on clear display. The lesson to be learned from this is that if you find a windscreen ticket on your car and believe your permit was correctly displayed you should immediately take a number of photographs from several angles and distances to support your case. It appears judges are not yet fully clued up to the nefarious tricks that the dodgier parking companies get up to. You've been had. The ticket has clearly been moved after the warden's photograph was taken. The top right corner is folded over. It couldn't have been moved by the warden as he couldn't get in the car- who do you think might have done it, then? Where's the windscreen wiper in the PPC's photo? Did the warden lift it in order to position his camera lower, or is it a photo of a ticket on a completely different vehicle? It seems impossible to take a photo of the ticket without capturing that wiper. Also, and as best as I can zoom in, the dotted patterning on the windscreen surround seem different between the two photos, but that just may be the quality of the photos. Is it possible to have a ticket expire before 23:59 at this car park? Would be an interesting debate whether the date being shown is sufficient. Also depends on the T&Cs saying what part of the ticket has to be visible. Never have liked Pay and Display parking, even if run properly. Minster Baywatch - you got Gladstoned! Why do judges do this?